Alexander Trentin: "Japan, It's Time to Finally Overthrow Cash!" 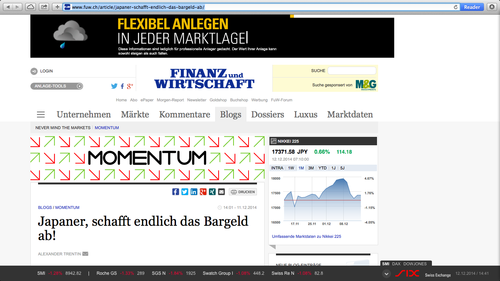 Some of the best reporting ever on my proposal to eliminate the zero lower bound is in German. I am delighted by Alexander Trentin’s article “Japaner, shafft endlich das Bargeld ab” on the Finanz und Wirtschaft site. (“Finanz und Wirtschaft” means “Finance and Economics.”) And I am very grateful for his permission to publish an English translation here. Has the Bank of Japan really done everything possible to create inflation? No, says a US economist, as long as cash still rules in Japan. Source: Bloomberg. Red stripes, left scale: BOJ balances in trillions of yen. Jagged blue line, right scale: Yen per US dollar. But stimulating growth by stimulating inflation is much more difficult than devaluing the currency. In the last two quarters, the economy contracted. And in October, prices fell again. The temporarily high inflation of 2% in April was achieved by increasing the consumption tax. Now, the decline in oil prices has lowered inflation expectations in Japan. Source: Bloomberg. Red bars, left scale: quarterly growth in GDP. Blue line, right scale: inflation in the previous month. The consensus among market analysts is that the Bank of Japan has fulfilled its task. And it has been expanding its QE program. Harvard economist Kenneth Rogoff argued recently that structural reform is the only hope for Japan’s economy, because the Bank of Japan has done all it can: that is the only way Japan can get out of deflation and low growth. He presented his view last year at the Bank of Japan and Japan’s Ministry of Finance. And according to Kimball’s website, the Central Bank and the Ministry of Finance were “interested” in his proposal. In Kimball’s proposal, paper currency would continue to exist, but prices would be expressed in units of electronic money. There would be a time-varying exchange rate between electronic money and paper money. “We wouldn’t have to worry about [central banks] ever again seeming relatively powerless in the face of a long slump" Kimball writes in a column. But Kimball is no fan of inflation who wants to make the money in our pockets or in our bank accounts worth continually less and less. On the contrary, he argues that the possibility of negative interest rates makes the generally accepted inflation target of 2% unnecessary. An inflation target of 0%–that is, absolute price stability–would then be possible. His reasoning: Central banks want an inflation rate of 2% so they have room to push the real interest rate low enough. The real interest rate is the nominal interest rate minus the inflation rate. For investment decisions, the real interest rate is crucial. If the nominal interest rate can’t go below 0%, an inflation rate of 2% is needed to make a real interest rate of -2% possible. However, if the nominal interest rate can be negative, then a central bank no longer needs to get the leeway for negative real interest rates from a positive rate of inflation. "The benefits of true price stability alone would easily make up for any inconvenience of [electronic money,]” believes Kimball. If the Bank of Japan cannot generate persistent inflation even after continued huge bond purchases, maybe Japan will be the first nation to overthrow paper money.